Children like to be pandered to. Grown-ups expect, and demand, honesty from political figures. Clinton used her speech to the American Israel Public Affairs Committee meeting, the gathering of some of the most powerful lobbyists in Washington, to lambaste Donald Trump for saying he’d try to be neutral in heading up negotiations between Israel and the Palestinians. Donald Trump should be lambasted. He is wrong on everything most of every day. But, like a clock, he is right twice a day and this a point on which he is correct. The US cannot be an honest broker in the Mideast conflict if it is more Israeli than the Israelis, which it typically is. Palestinian negotiators over the years complained that they’d get an Israeli proposal, then go to the US to tweak it, and get back the same proposal from Dennis Ross or some other American partisan of Israel who had been put in a position to shape negotiations on the American side. For Clinton to imply that Trump, by saying he wanted to be neutral in negotiations, was indicating that he would compromise on Israeli security is just dishonest. I’m not sure what conventional security threats Israel has. Lebanon is weak and a mess. Syria is in complete disarray. Jordan and Egypt have peace treaties with Israel. Those are the immediate neighbors. Libya has fallen apart. Tunisia doesn’t care and anyway is also small and weak. Turkey and Israel have their tensions, but do a great deal of business, including military business, with each other. Iraq is in disarray. Iran is so distant as to pose no conventional threat, and does not have nuclear weapons, which Israel does. So what is the threat to Israeli security Clinton is talking about? It is that Palestinian children might not have to live under Occupation. Clinton perpetuates the Israeli propaganda talking point that they are the ones who are being oppressed, and that even-handed moves toward peace threaten their security, which is alleged to be precarious. In his address to AIPAC, Trump seemed to be trying to make amends for his recent comments on Israel and Jewish-American voters, some of which trafficked in the worst stereotypes. Four months ago, speaking before the Republican Jewish Coalition, Trump called himself “a negotiator, like you folks.” He went on, “You’re not going to support me, because I don’t want your money.” But it wasn’t until he was asked whether he believes that Jerusalem is the undivided capital of Israel, a non-negotiable for such a crowd, that audience members finally turned against him. Trump obfuscated, saying that he would wait to meet with Israel’s Prime Minister, Benjamin Netanyahu. He was booed, loudly. That same day, in another diplomatic no-no, Trump seemed to place the onus of peace negotiations only on Israel. A deal, Trump said in an interview with the Associated Press, “will have to do with Israel and whether or not Israel wants to make the deal—whether or not Israel’s willing to sacrifice certain things.” Later, he described himself as wanting to be “sort of a neutral guy” when it came to the Israeli-Palestinian issue. On Monday, that neutrality went out the window. “There is no moral equivalency,” Trump declared. “Israel does not name public squares after terrorists. Israel does not pay its children to stab random Palestinians.” Despite calls from dozens of rabbis and other Jewish leaders to boycott Trump’s AIPAC appearance, the candidate received a relatively warm reception from a group that is officially nonpartisan but that has grown increasingly vocal in its criticism of President Obama in recent years. Never one to adhere to formality, Trump sensed an opening. He garnered perhaps the longest applause of the speech with a self-interruption: “With President Obama in his final year,” he began, then let out an improvised “Yay!” It was a telling moment for an audience that prides itself on not endorsing candidates explicitly. 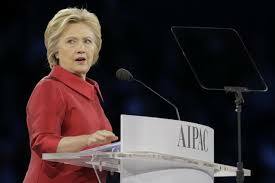 Title: Hillary Clinton Equates BDS With Anti-Semitism & Bullying. Source: Secular Talk. Date Published: March 22, 2016.